Yes, the seafood is fresh. Yes, it’s all delicious. But what struck me the most about every single meal that we had there was the pride that every dish had. From the way it was prepared to the hands that served it, you could tell that New Orleans was feeding you something that they were proud of. And rightfully so. Whether a humble, yet stellar po-boy at the famed Domilise’s or a morning-after greasy-spoon cure from the characters at The Grill…or even the fanciest dinner in town, there’s authenticity, pride, in soul in every bite. 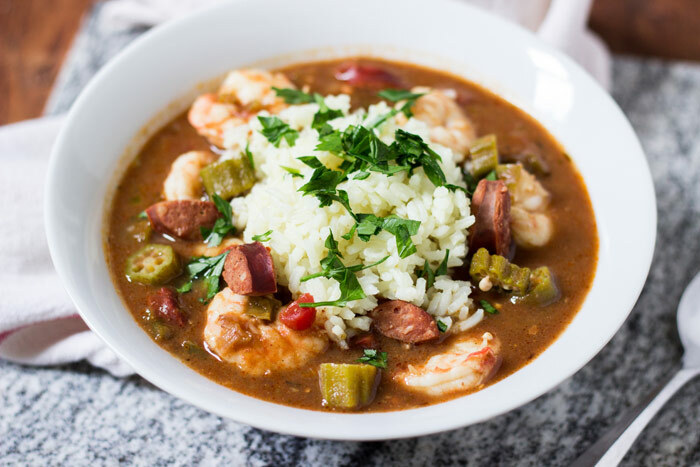 To remember my trip, I made a batch of this gumbo, prepared in the traditional way with a really dark roux and filled with andouille, shrimp, and okra. In gumbo, as in most Cajun dishes, everything starts with a roux. Unlike what most of us might be used to, where we sauté vegetables, then add flour and stock, in gumbo the ordered is reversed. 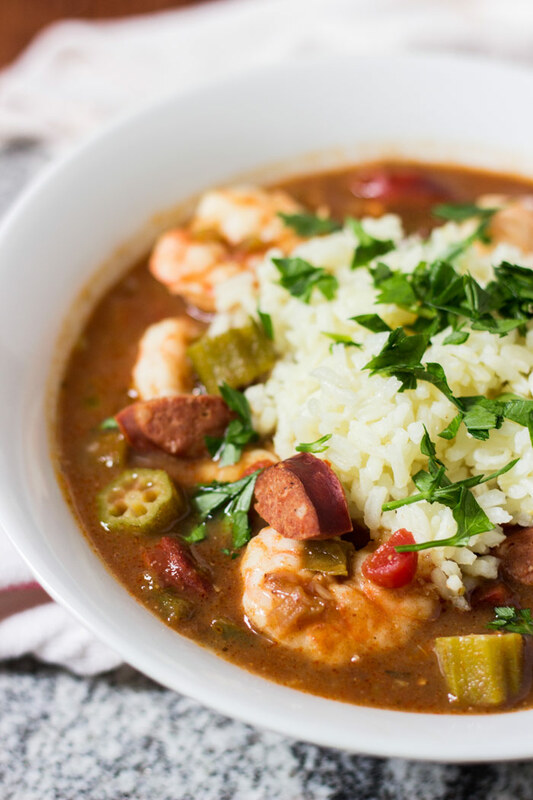 While I do include a small amount of spices in the recipe to help boost the flavor, the main and most important component of this gumbo is undoubtedly the roux. After rendering out enough andouille sausage to feed a small army (or, only 3 of it as it were), you slowly cook equal parts of flour and oil together for nearly 30 minutes until it caramelizes to a golden brown. How dark you like your roux is up to you, but I prefer mine to be on the darker side, which gives this gumbo a subtle yet pleasant bitterness. How dark, you ask? The best way I can describe it is “black coffee with a very small splash of milk. Once full cooked (don’t rush this step), then the vegetables are added and sautéed directly in the roux. While French cuisine has the classic combination of carrots, onion, and celery – called mirepoix – Cajun cuisine relies on it’s version, called the Holy Trinity. Onions and celery are still included in the mix, but carrots are tossed out in favor of green bell pepper. A small amount of tomatoes are added to the pot, along with some Cajun spices, stock, and the andouille sausage and let to simmer for an hour. Then, add the okra, let it go for a while longer, and, at the last minute, add in the shrimp. Towards the end of cooking, you can also bring in one of the secrets of Cajun cooking – filé powder. 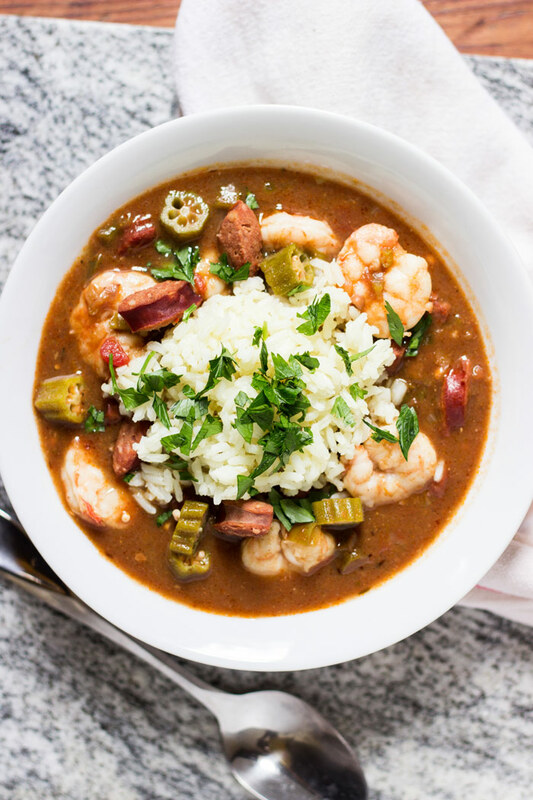 Made from the ground leaves of the sassafras tree, filé is traditionally used as both a thickener and a condiment, giving the gumbo a unique nutty flavor that’s subtle…but there. Serve it with a heaping of well-buttered white rice, some chopped parsley or scallions, a bottle of Louisiana hot sauce (preferably Crystal, which you’ll find on every table in New Orleans), and extra filé powder for sprinkling on top. Time-consuming? A little. But trust me, it’s worth it. Taking the time to cook the roux low and slow, caramelizing it to just the right color, then layering in the rest of the ingredients over several hours while the gumbo bubbles away gives some soul to this dish. You can practically taste New Orleans in one bite. First, mix all ingredients for the cajun seasoning and set aside. In a large dutch oven, heat 2 tablespoons of vegetable oil over medium-high heat. Add the andouille sausage and brown for 5-6 minutes. Remove the sausage with a slotted spoon to a paper-towel lined bowl and set aside. Next, make the roux: add the remaining 1/3 cup vegetable oil to the dutch oven and reduce the heat to medium-low. Sprinkle in the flour, whisking constantly. Allow the flour and oil mixture to cook gently for 20-30 minutes, stirring every few minutes to make sure the flour doesn't burn. 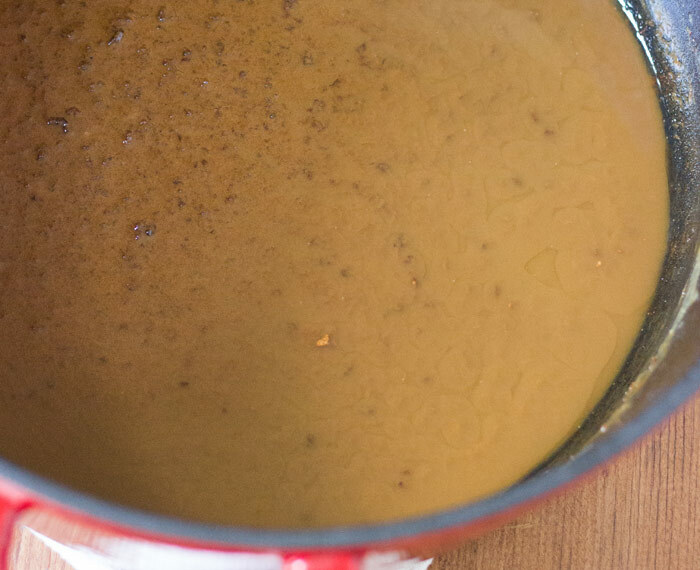 You want the roux to become a very dark caramel color, like black coffee with just a splash of milk. In a separate pan, heat the chicken broth until just simmering. 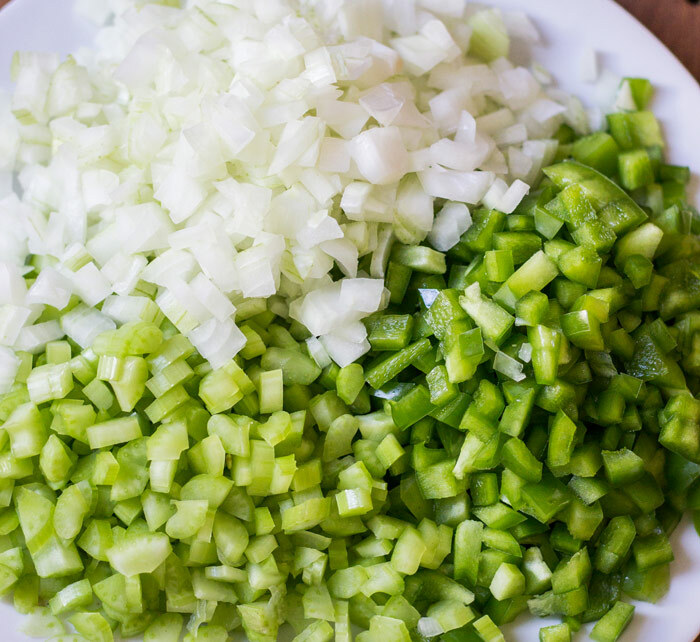 Increase the heat of the dutch oven to medium-high and add the onion, green bell pepper, and celery. Sauté, stirring frequently, for 8-10 minutes until the vegetables have softened. Add the garlic and cook for another 2 minutes. Add the tomato paste and all of the cajun seasoning then mix thoroughly and cook for another 5 minutes. Add the diced tomatoes, fresh thyme, and bay leaves. 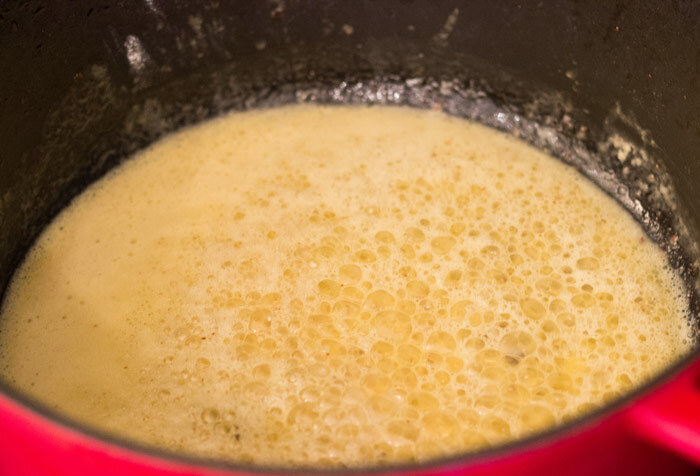 Add the chicken broth, one ladle at a time to start, mixing as you add, then pour in all of the broth. Add the reserved andouille sausage. Bring to a boil then reduce to a gentle simmer, stirring occasionally, for 1 hour, uncovered. If you see oil coming to the surface of the gumbo, skim it off. After 1 hour, the gumbo will have reduced and thickened some. Add the okra and cook for another 30-40 minutes until the okra has softened but still has texture. Add the shrimp and cook for another 2-3 minutes until the shrimp turn opaque. Remove from the heat, stir in the filé powder, then serve with white rice, chopped parsley, scallions, hot sauce, and more filé powder if desired. Looks like the perfect way to remember your trip! Yum! @lizfloatingkitchen:disqus Thanks Liz – we’re still enjoying the leftovers. When do you put the sausage back in? @denisegalvan:disqus Great question! You should add the andouille back in after adding the chicken broth, in step 6. We have updated the recipe.